Yesterday, Cathy McMorris Rodgers released a statement supporting the Senate Republican's refusal to consider President Obama's Supreme Court nominee. 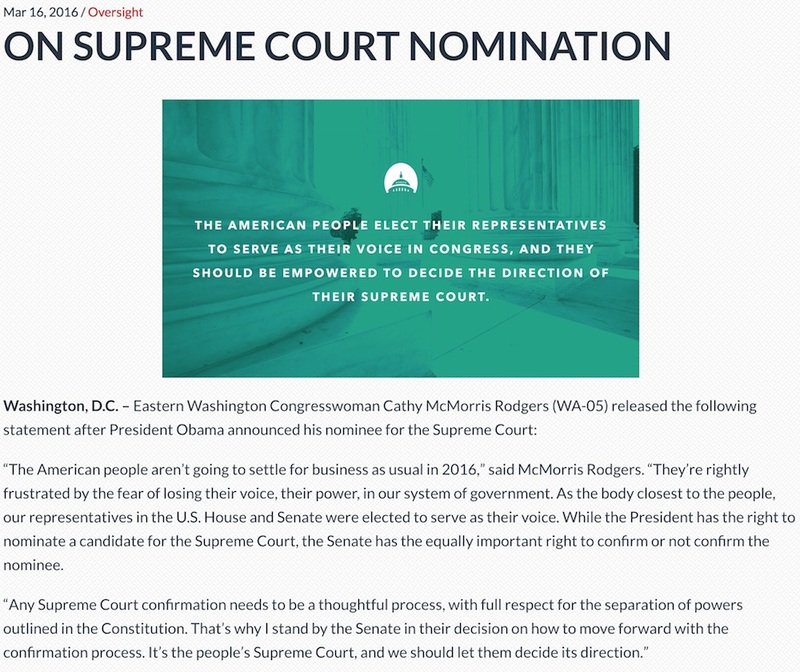 "While the President has the right to nominate a candidate for the Supreme Court, the Senate has the equally important right to confirm or not confirm the nominee." Far be it from our congresswoman to outline how Merrick Garland's nomination did not involve a thoughtful process or how it disrespects the US Constitution's separation of powers. But listen to her talk about letting the people decide. Have a look at what people are deciding right now. They're deciding to support Donald Trump as the Republican Party's presidential nominee. The same Donald Trump who denigrates women, pretends to be a bible-thumping Christian, says whatever he thinks is useful even if it's the opposite of what he said just an hour before, encourages supporters to beat up and expel protesters, says Mexicans are rapists. and even belittled Senator John McCain as a war hero because he was captured and that he (Trump) likes those that weren't captured. Cathy McMorris Rodgers, who holds a leadership position in the Republican House, remains hunkered down under a cone of silence rather than address the topic of a Mussolini-like figure who seems to be well on his way towards obtaining the party's nomination--and threatens violence if the people's will is subverted! On Trump she says nothing. But just let the president do his constitutional duty and nominate a judge to a vacant seat on the United State Supreme Court. Let him do that and our congresswoman, like a sleeping turtle coming up for a moment to get breath of air, pops up and objects. Then she quickly disappears into the murky depths, ignoring or hiding from the rising storm that is Donald Trump. Let the people decided indeed. Because she isn't about to. In addition, on one hand our congresswoman along with the Republican Senate and House leadership wants, to wait for the election so the people can decide. On the other, the Republican leadership is trying to come up with ways to prevent Donald Trump from becoming the party presidential nominee in spite of the will of the people supporting him. Why do only those in the Republican leadership get to decide what and when the people get to decide? It's so ironic that the Republicans want the voters to choose the next Supreme Court Justice but they want to override the voters choice for their nominee.